U.S. 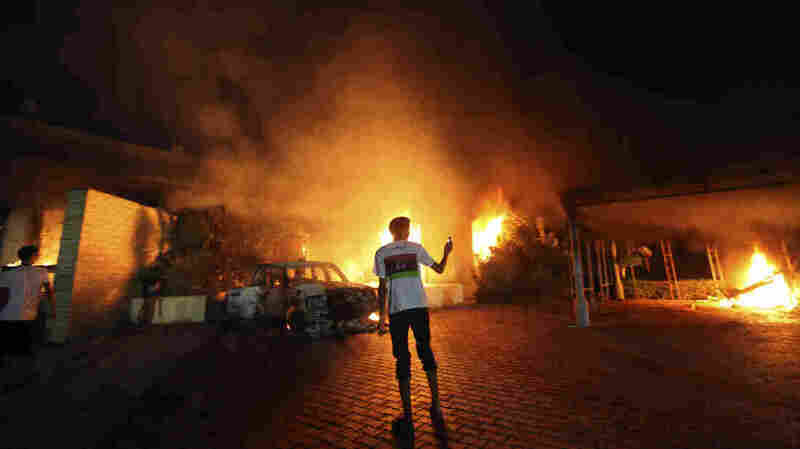 Ambassador To Libya, Three Other Americans Killed In Benghazi Attack : The Two-Way The deaths came after protesters fired a rocket-propelled grenade into the consulate, and protesters in Egypt scaled the U.S. embassy walls there. Update at 7:02 p.m. ET. The U.S. ambassador to Libya and three other staff members were killed in an attack against the American consulate in Benghazi, last night. The attack happened over an American-produced film that criticized the prophet Muhammad. U.S. Ambassador to Libya Chris Stevens supported Libya's transition to democracy. -- Quoting U.S. officials, the AP reports that the Pentagon is moving two warships toward the Libyan coast. CNN is also reporting the move. -- The remains of all four Americans killed in Libya have been recovered. -- American officials are "reluctant to say, at this stage, that this [attack] was planned." -- The State Department says this was "clearly a complex attack." But it is still not clear what was going on outside the diplomatic compound at the time of the attack. -- President Obama condemned the attack. "There is absolutely no justification for this senseless violence. None," he said. -- Republican presidential nominee Mitt Romney weighed in, criticizing a statement issued by the State Department calling for calm in both Libya and Egypt and assuring Muslims that the American government condemned the film. -- The identity of the filmmaker is still largely a mystery. The U.S. ambassador to Libya and three of his staff members were killed in an attack on the American consulate in the country's eastern city of Benghazi, the White House confirmed Wednesday. The deaths of Ambassador Chris Stevens and the other embassy employees came after an angry mob surrounded the Benghazi consulate Tuesday night to protest a film ridiculing Islam's Prophet Muhammad that had been promoted by an extreme anti-Muslim Egyptian Christian campaigner in the United States. The mob was armed with guns and rocket-propelled grenades, according to The Associated Press, but it was not immediately clear how the ambassador or the others were killed. President Obama on Wednesday reiterated the U.S. condemnation for the attacks "in the strongest terms" and vowed to "work with the Libyan government to bring the killers to justice." "There is absolutely no justification for this senseless violence. None," he said. The president said that the attack "will not break the bonds between the United States and Libya." The State Department also named Sean Smith, a foreign service information management officer and 21-year diplomatic veteran, as among the dead. Release of the others' names was awaiting notification of their next of kin, the Department said. Secretary of State Hillary Clinton said Wednesday morning that U.S. and Libyan security personnel "battled the attackers together" during the assault. "This is an attack that should shock the conscience of people of all faiths around the world," she said. "There is no justification ... violence is no way to honor faith," Clinton said. The State Department website says that Stevens is the sixth U.S. ambassador to be killed by terrorists since 1968 and the first since 1979. Stevens and Smith were among a group of embassy employees who had gone to the Benghazi consulate earlier to help evacuate staff there as the building came under attack by the armed mob, the AP reports. Stevens, 52, was a career diplomat who spoke Arabic and French and was the first U.S. envoy to the Libyan resistance, which overthrew Moammar Gadhafi in 2011. He was named ambassador earlier this year. NPR's Michele Kelemen says Stevens was well known to journalists covering the region. "He served in a lot of places in the Middle East," she says. "This was his second tour in Libya. He played a key role in the uprising there. He was the U.S. envoy to the opposition in Benghazi when the opposition was fighting Col. Moammar Gadhafi," Kelemen says. NPR's Greg Myre, who was formerly based in Jerusalem, has this personal remembrance of Stevens. In Egypt, hundreds of people protesting the film breached the walls of the U.S. Embassy in Cairo on Tuesday. The protesters tore down an American flag, replacing it with a black Islamic banner. In a statement on Tuesday, the president said that he was directing "all necessary resources to support the security of our personnel in Libya, and to increase security at our diplomatic posts around the globe." NPR's Tom Bowman reports that a contingent of U.S. Marines from the Fleet Antiterrorism Security Team, or FAST, was being dispatched to Benghazi. In his statement, President Obama said Stevens and the others killed "exemplified America's commitment to freedom, justice, and partnership with nations and people around the globe, and stand in stark contrast to those who callously took their lives." In the first hours after the embassy attack and before it was learned that Ambassador Stevens had been killed, Republican presidential hopeful Mitt Romney weighed in, criticizing a statement issued by the State Department calling for calm in both Libya and Egypt and assuring Muslims that the American government condemned the film. Obama campaign spokesman Ben LaBolt responded that he was "shocked" in an email to the AP and that "at a time when the United States of America is confronting the tragic death of our diplomatic officers in Libya, Gov. Romney would choose to launch a political attack." On Wednesday, Romney stood by his remarks, calling the State Department's early statement "inappropriate and disgraceful." "It's terrible ... for America to stand in apology for our values," he said. Romney said that the State Department issued the statement as "our grounds [were] being attacked and being breached." But NPR's Leila Fadel says the U.S. statement was issued at noon in Cairo, long before protesters assaulted the embassy compound there or anyone was killed in Libya. Asked whether he might have spoken too soon about the events in Libya, Romney said: "I don't think we ever hesitate when we see something that is a violation of our principles." Sen. John Kerry, D-Mass., chairman of the Senate Foreign Relations Committee, said in apparent reference to Romney's remarks that "it is exactly the wrong time to throw political punches. It is a time to restore calm and proceed wisely." Sen. Jim DeMint, R-S.C., in a statement on his website, defended Romney's, saying the GOP hopeful "is absolutely right, there is no justification for these deadly attacks and we should never apologize for American freedom. "It was disheartening to hear the administration condemn Americans engaging in free speech that hurt the feelings of Muslims, while real atrocities have been repeatedly committed by Islamic radicals against women, Christians, and Jews in the Middle East," he said. The California-based filmmaker Sam Bacile, whose movie sparked the protests, went into hiding Tuesday, according to the AP. The two-hour film has been shown just once, earlier this year in Hollywood, but a 13-minute English-language trailer of the film, Innocence of Muslims, was on YouTube. Bacile describes himself as an Israeli Jew. Two-Way colleague Eyder Perlata has a detailed take on the film and YouTube trailer that sparked the initial protests. The remains of all four Americans killed in Libya have been recovered, says NPR's Dina Temple-Raston, who spoke with American officials familiar with the investigation into the events. 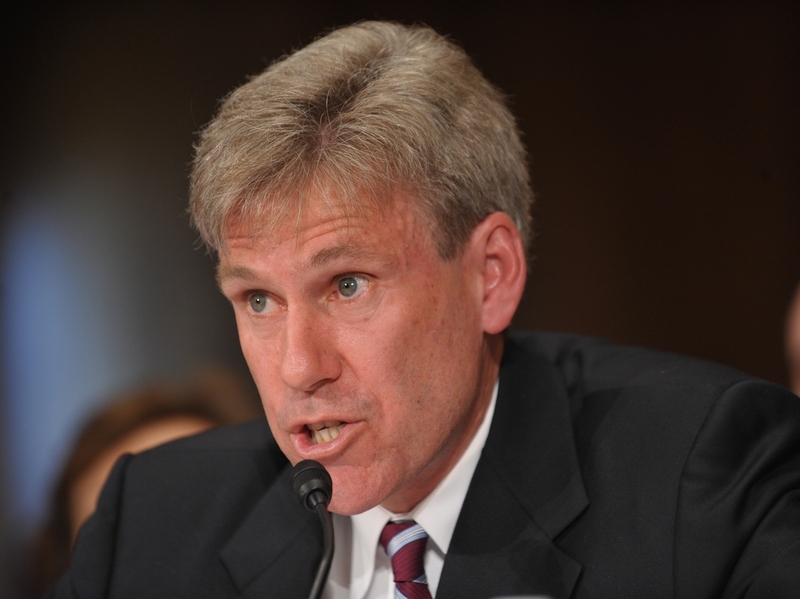 The officials said that Ambassador Stevens, who was based in Tripoli, was visiting Benghazi for the opening of an American cultural center there. Temple-Raston reports that officials confirmed that members of Ansar al-Sharia, a militant group affiliated with Yemen-based Al-Qaida in the Arabian Peninsula, were part of the mob that assaulted the Libyan consulate. It was not clear, however, whether the group's involvement went any further. Ansar has denied it was behind the attacks. Temple-Raston's sources are "reluctant to say, at this stage, that this [attack] was planned." The officials say there was no specific piece of intelligence suggesting that the consulate would be attacked, but that a pattern observed in recent months suggested the possibility that someone or some group might be waiting for an opportunity to attack a U.S. target. National Security Council spokesman says it is too soon to know what the motive behind the attack was. "There is a lot of press speculation for who did this and why but at this stage it would be premature to ascribe any motive to this reprehensible act," Tommy Vietor said in a statement. "As the President said, make no mistake, we will work with the Libyan government to bring to justice the killers who attacked our people."